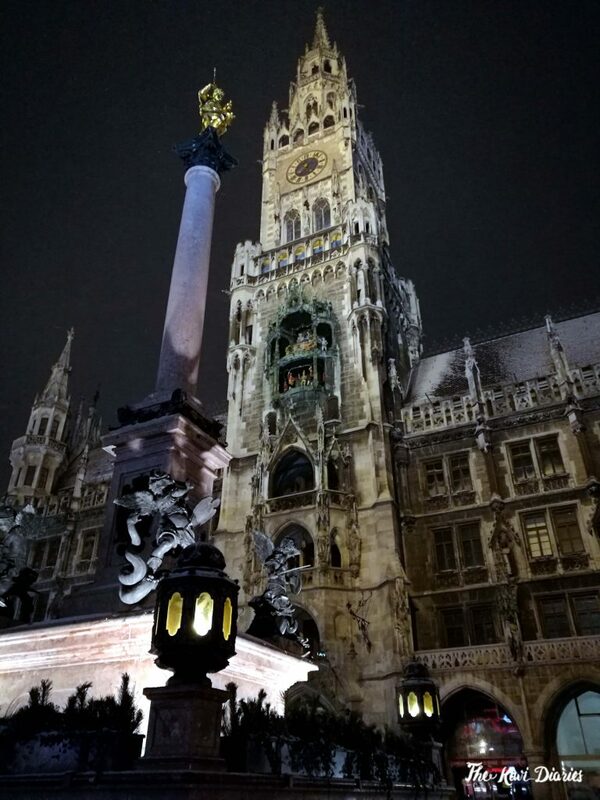 The other day I came across with some photos of our Prague-Munich trip with my family and le boyfriend and I was overcome with major melancholy. 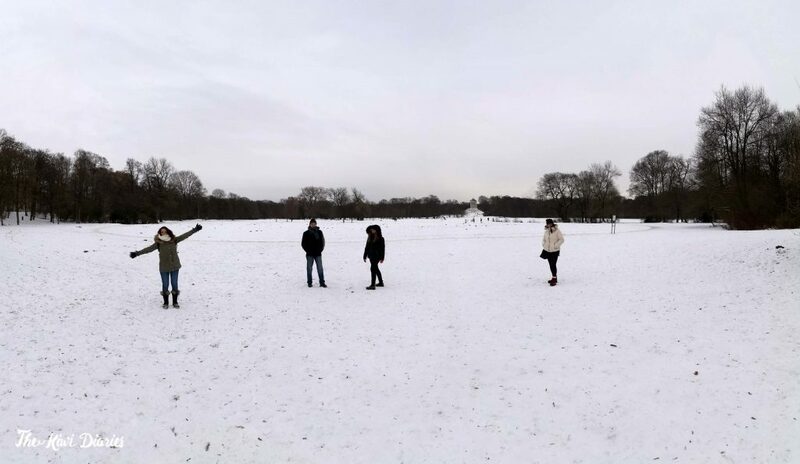 The train rides, the snow, the Christmas markets, and given that you seemed to really liked the 24hs in Prague post, I’d thought I’d continue writing them. 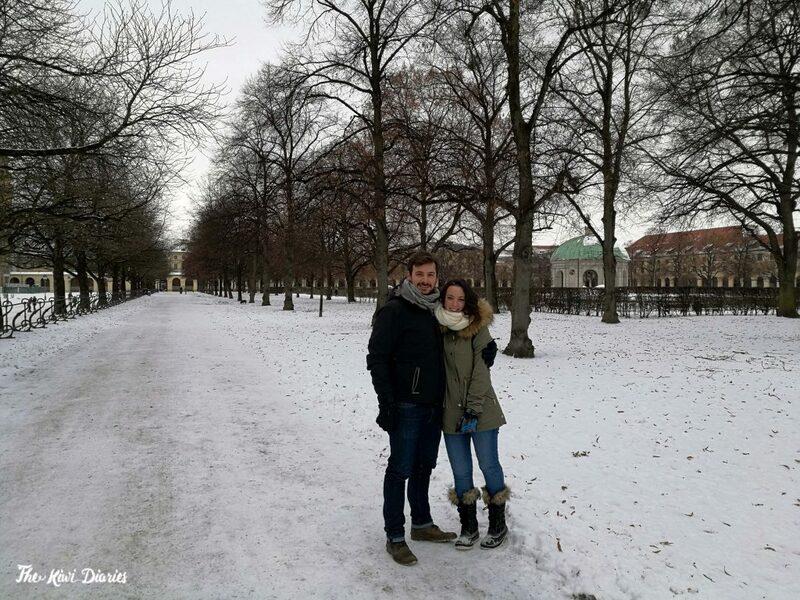 There are many options when it comes to getting to Munich, but personally, and if you have time the best way to get there is by train. (6 hours from Berlin) If you travel by night you can pull the seats and make them into a bed and by day you can get a glimpse of the different landscapes as the train stops in several little (and big) cities. A Bavaria Breakfast. Different kinds of bread, cheese, and ham everything you need to get you energy for the day. Altstadt. 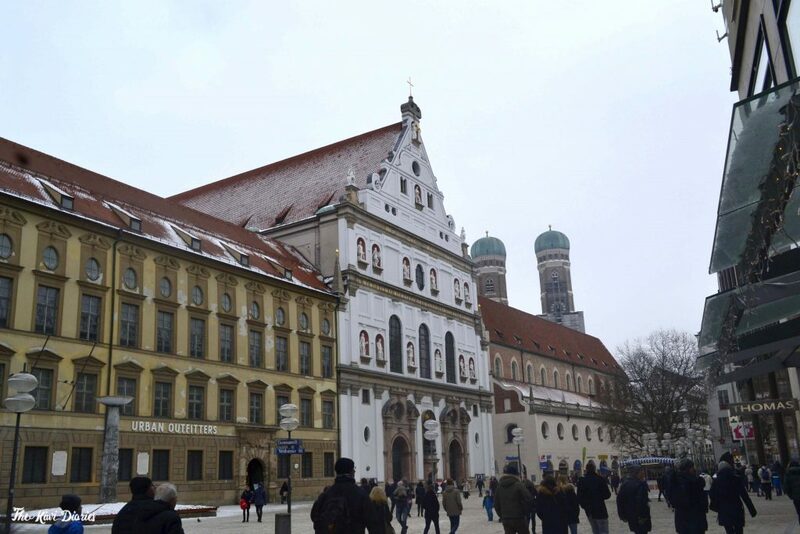 Starting from the main train station (Haupbahnhof) a clear road will take you through the Altstadt, where you can stop at the gates of the Karlplatz, St. Michaels Kirche, Peter’s Kirche and the Alte Rathaus in Marienplatz. 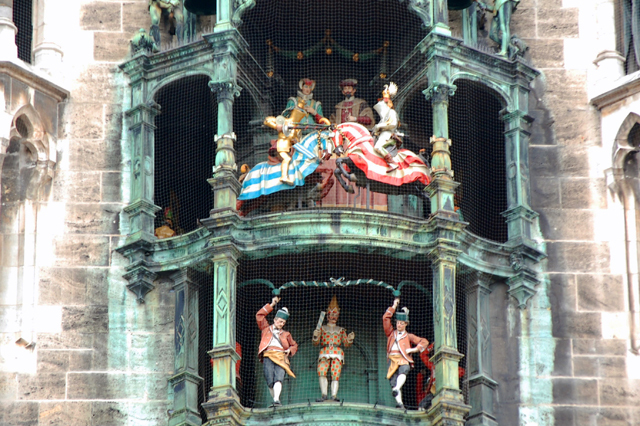 The Rathaus-Glockenspiel. 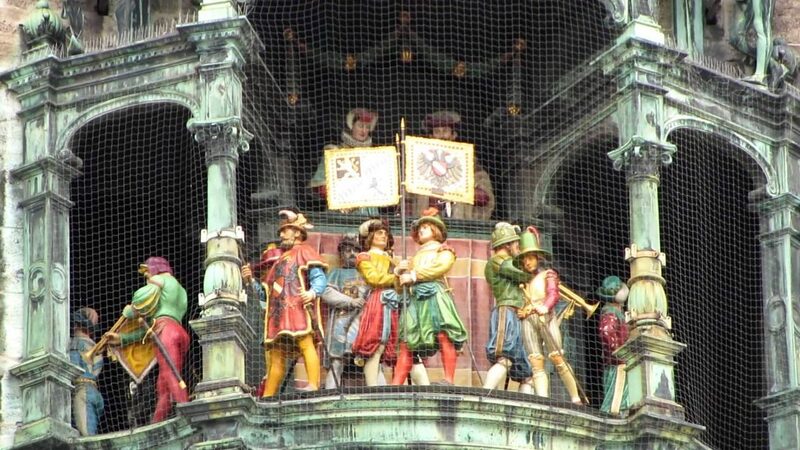 Every day at 11 am and 12 pm (and in summer it might ring at 5 pm) the clock at the Rathaus Clock chimes marking the beginning of a 15 minutes show that re-enacts two stories from the 16th century. 32 wooden figures move at the sound of the bells re-telling the story of the wedding of Duke Wilhelm V of Bavaria and Renata of Loraine from France and how it became a symbol of unity between the two powers. 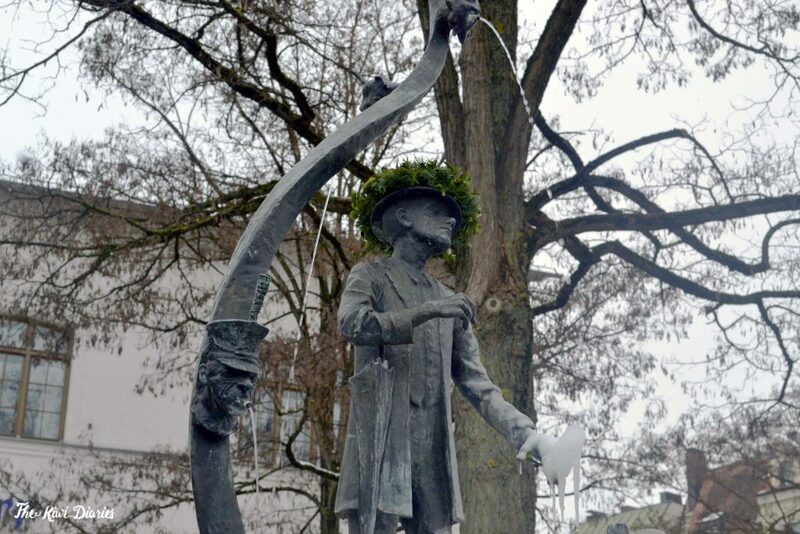 After it we can see the Schäfflertanz, telling the story of the Coopers that were said to have danced through the streets of Munich during the plague of 1517. Their dance was seen as a token of loyalty and perseverance during a hard time. A little rooster finally peeps three times to end the spectacle. Weissbiers & Weisswursts. 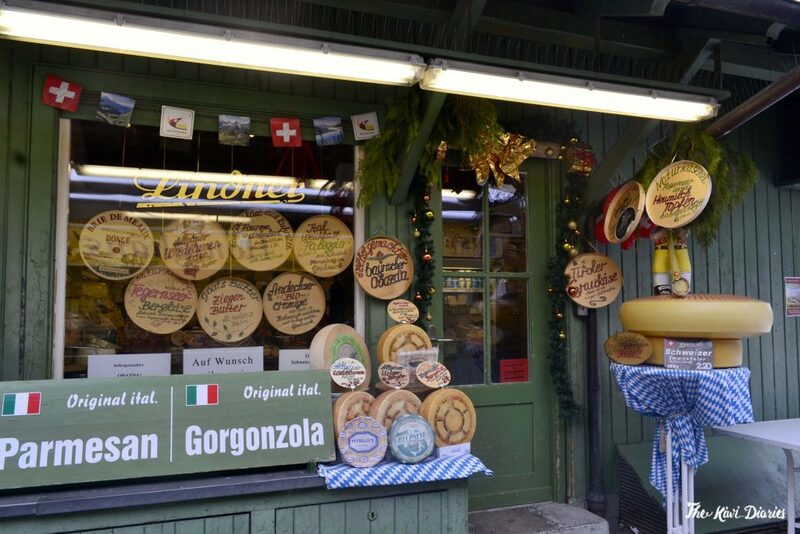 When in Bavaria, Especially if you visit in winter, you should treat yourself to a full Bavarian feast. 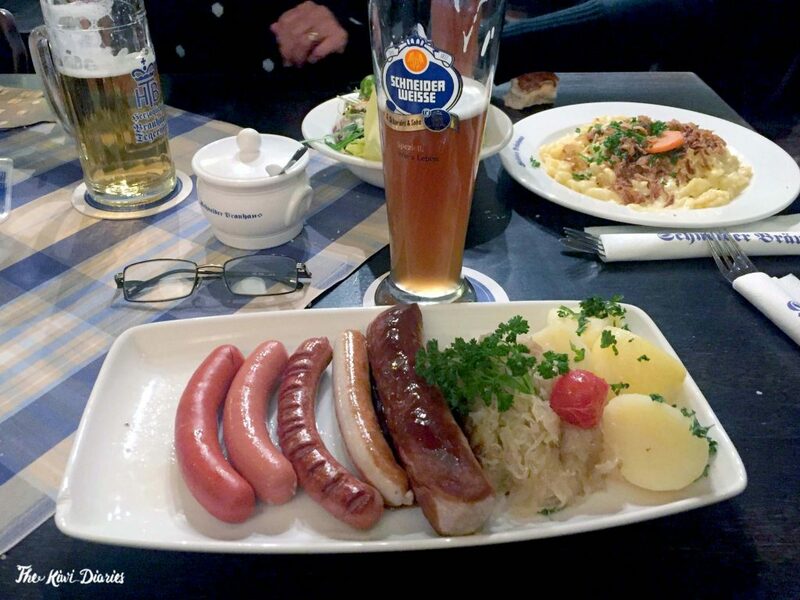 Wheat beer, white sausages with sweet mustard, saurkraut, and pork knuckle are just some of the options to choose from, and if you not in the mood for meat you can order my personal favourite Spatzels. That time we visited the Schneider Bräuhaus, but there are countless Brewhouses to choose from. City by night. 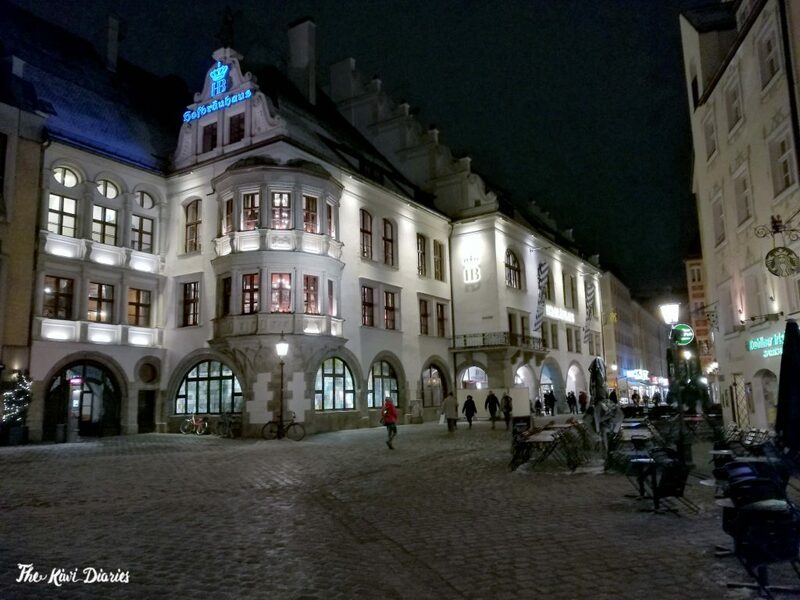 Even if go out to have dinner somewhere, take the time to appreciate the city by night, maybe walk through the Altstadt again, get lost through the little streets. 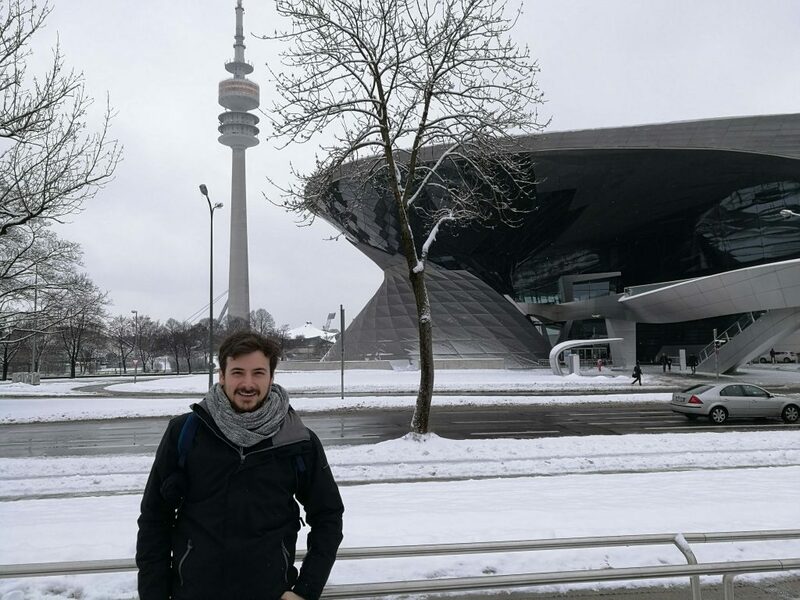 Olympiapark & BMW Welt. We decided to begin the day by taking a walk through the Olympic park, we were lucky to find that a marathon was going on so we stopped for a while to cheer the participants. 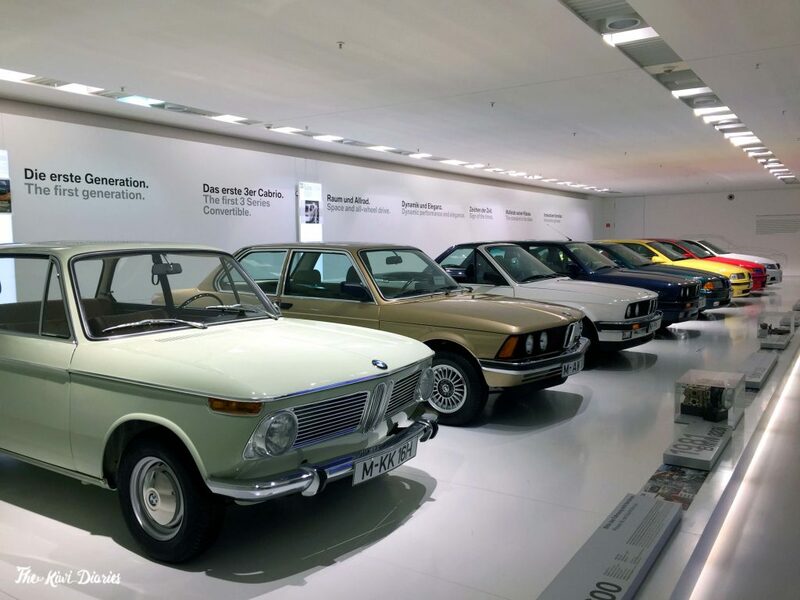 The park is quite big and since it began to rain and the cold got the best of us, we decided to step into the BMW Welt museum that was a few meters away. The admission price was quite expensive, we think that 10 euro per person is a bit much to what is basically a huge advertisement for the company, so a couple stayed behind. But if you are a motorhead maybe this is the place for you. A quick bite. Even though Le father made it its mission to have German food for every single meal, we had to force his hand search for some quick and cheap options for lunch. That how we found La pizzeta it’s location is pretty centric and you can buy a goo range of slices of pizza for a cheap price. Is worth to try it if you are on the look our for something quick and tasty. 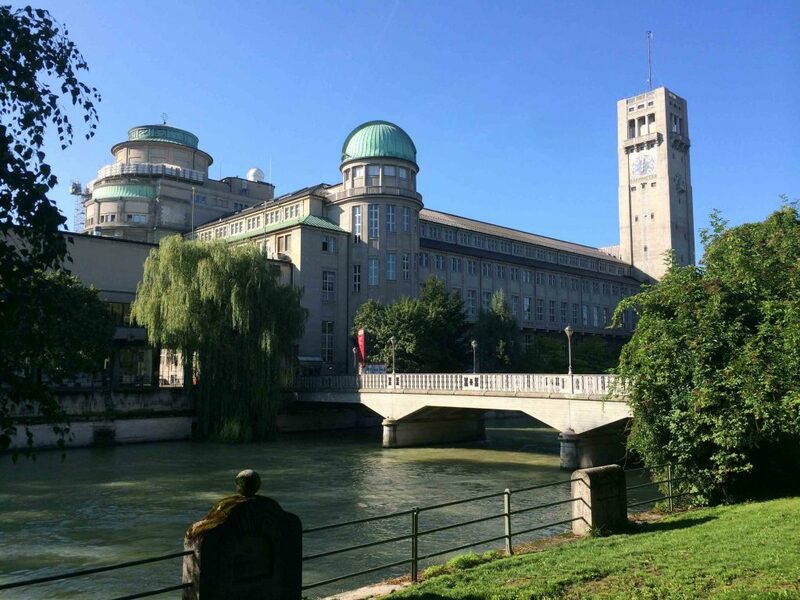 Deutsches Museum. We decided to spend the rest of the day discovering the Deutsches Museum (Almost everything is closed on Sundays and this is why we decided to leave the museum for this day) You can find everything from the study of the environment and its materials, to the study of space, physics, new technologies such as biotechnology and DNA studies and a whole wing on toys, instruments and transport. Prices go fro 11$ per adult, kids up to 6 years old don’t pay and there are a lot of offers for families, groups, and students. A Brauhaus with history. 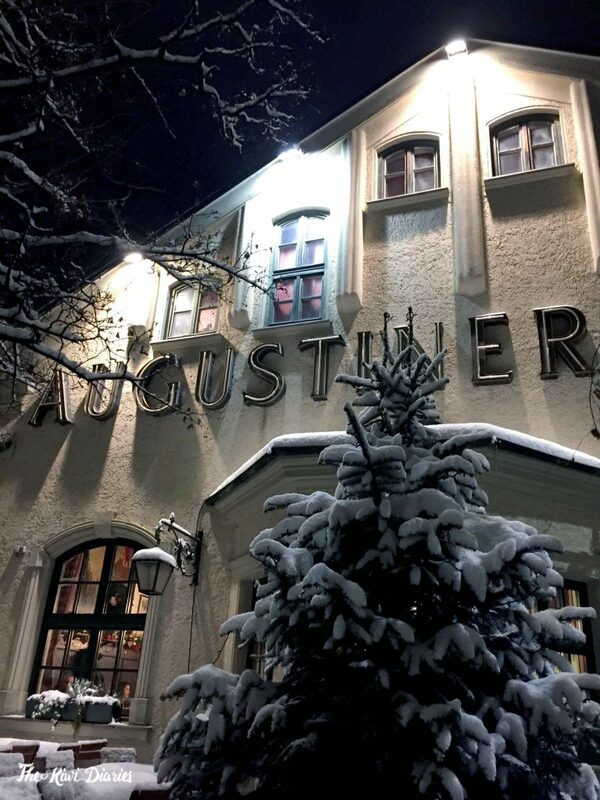 The Augustinerbrau is a 670-year-old brewery & Tavern and the perfect departing feast. 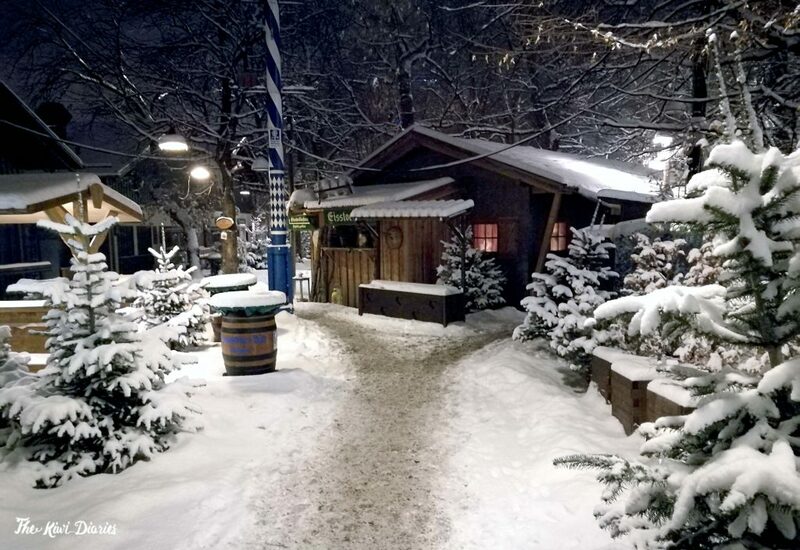 Besides the tavern, in this Brauhaus, you can find a Biergarten, a whole outside area with little cabins where you can get mulled wine in winter and a bocce court where we found a group of people downing hot wine and playing in the middle of the snow. 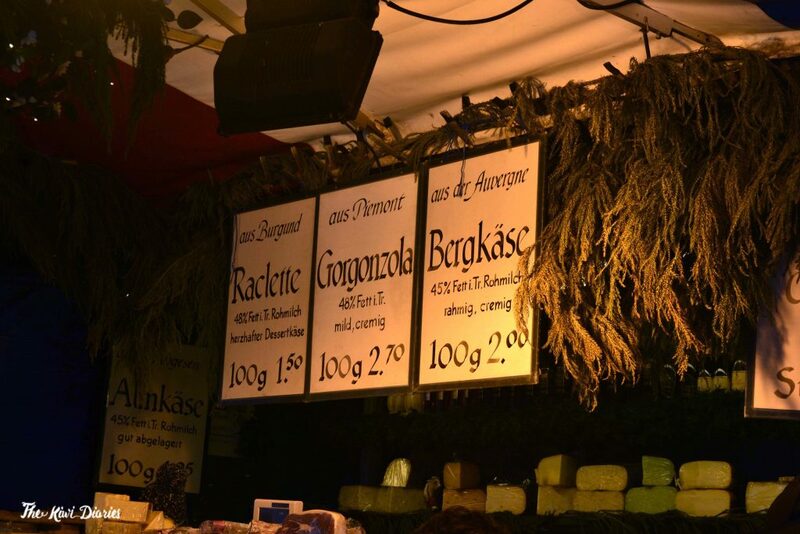 This place is known for its Oktoberfest celebrations and you can find all the classic Bavarian dishes. We decided to head back to the hotel after gushing over Bavarian food and German beer. We woke up at 5 am the next day and walked to the Haupbahnhof to take the train back to Berlin. 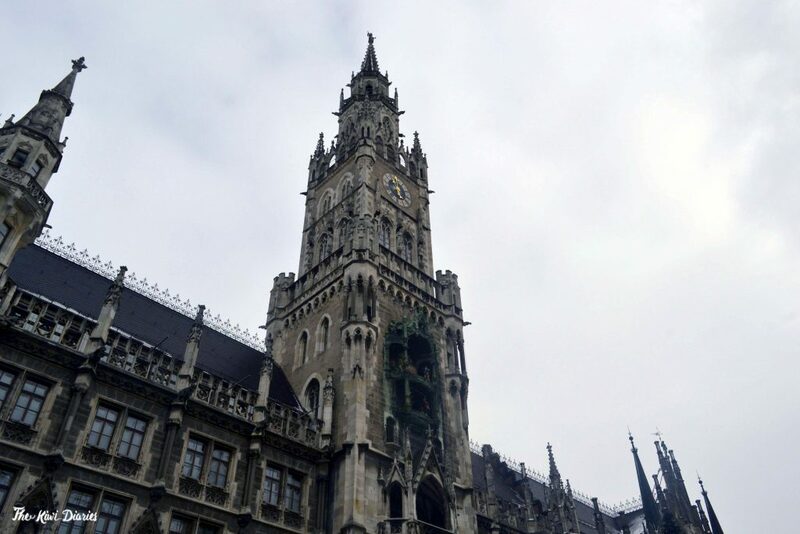 I hope you enjoyed this quick guide to Munich, let me know which places you would add to it? Beautiful 48 hours in snow , typical meals , cold noses and warm family . Que lindo! Lo describiste a la perfeccion. Muy buenas fotos!